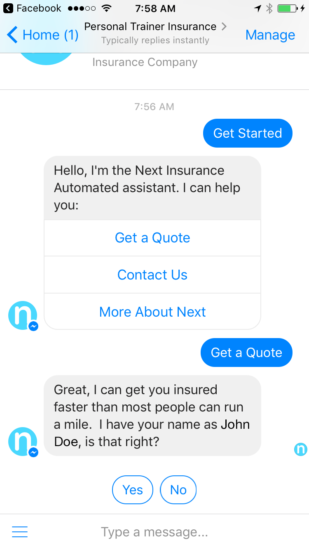 Home › Next Insurance Blog › Company News › The First Ever Chatbot For Small Business Insurance: Because who said insurance can’t be easy? The First Ever Chatbot For Small Business Insurance: Because who said insurance can’t be easy? Today, we’re very excited to announce the launch of the world’s first full insurance sign up via Facebook Messenger. 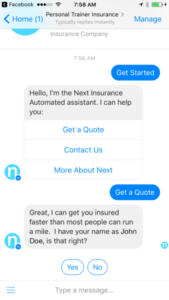 Alongside our friends at SmallTalk, we’ve built the first fully functioning chatbot for Facebook Messenger to make the sign up for insurance even faster and even easier. When you set the goal of fundamentally changing the way one of the oldest industries in the world operates, there are always going to be some naysayers. When we first launched Next, there were those that told us it would be impossible to show insurance companies that giving fair and transparent policies could be good business. We were told that small business owners would never trust a digital platform, however strong the promise they made. We were told that the insurance agent, however much they lacked in knowledge, influence or the ability to deliver real quality service, would never be replaced. Less than a year later, we’re proud to be serving thousands of physical trainers and photographers with more transparent and comprehensive policies built with their exact needs in mind. We’re proud to be creating a new status quo where insurance policies are good for the small business owners, and the negative relationship between policy holders and policy providers can finally be re-imagined. But changing the face of insurance for small businesses is not a one and done situation. Yes, we’re giving our users better policies at better prices. Yes, we’re providing them with more transparency than ever before. And yes, we’re doing so with a dramatically simplified and expedited sign-up process. Something to be proud of? Definitely. Something that motivated us to push even further? Absolutely. The way we see it, it’s time that insurance started working for you and the first step is meeting you where you are.